Since responding to such a question, all things considered, might need you to get philosophical, let me make it more specific. Did your mind play a highlights reel of rising stocks that seemed to have been waiting for you to buy so they could fall sharply? Or some that had been perennially moving sideways but shot up right after you sold them in exasperation? 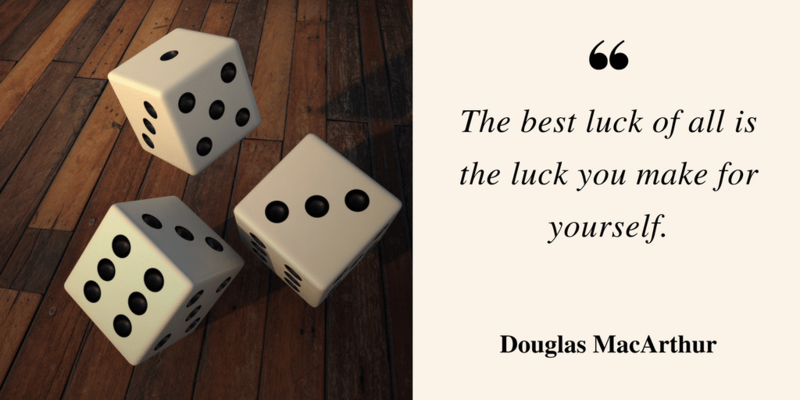 Chances are you thought of mostly negative outcomes when you thought of luck. Partly because losses tend to hurt roughly twice as much as gains of the same amount. But also because we are wired to attribute successes to skill and failures to luck. Why this post on luck? Because one of the most frequent questions I get from folks who’ve been flirting with investing is “Is it a good time to buy?” The question typically follows a few down days where news items like US-China trade wars, military action against Syria, (more) PSB frauds have been in the limelight. Imagine you’re a diligent investor who believes in investing regularly. However, for some reason you only have access to the markets on one random trading day in the year. Now, what if you had the worst possible luck? The day happens to be the high for that calendar year. Every year! Now that’s some bad luck. (You) India’s Unluckiest Investor: Invests on calendar year high. Regular Investor: Always invests on first trading day of calendar year. 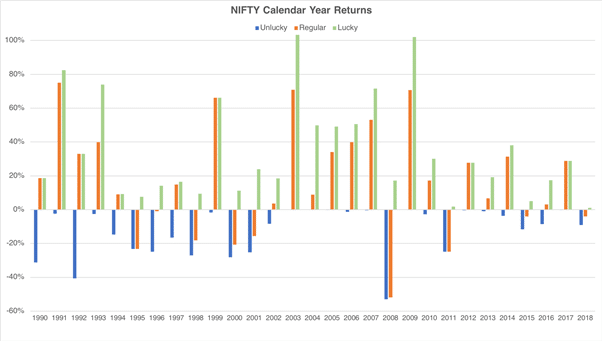 India’s Luckiest Investor: Invests on calendar year low. Chart shows two very different years (1991 and 2008) to illustrate when the three investors in our thought experiment would have bought. The lucky investor buys early in 1991 (a secular bull year) and late in 2008 (after world markets had fallen dramatically). The unlucky investor does the opposite, because, well he’s unlucky. Predictably, CY returns for the three investors look dramatically different. 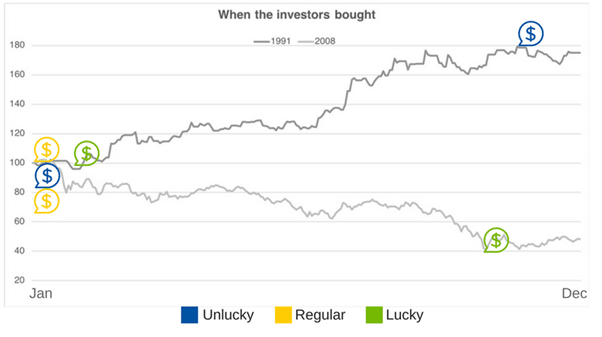 The lucky investor by experiment design has no down years while the unlucky investor has only down years. The regular investor has 30% down years. Same process, dramatically different yearly returns. So far, it couldn’t look uglier for India’s unluckiest investor. What about the outcome? Chart shows portfolio value over test period for the three investors who invest an equal amount (Rs, 10,000) every year, and never sell. 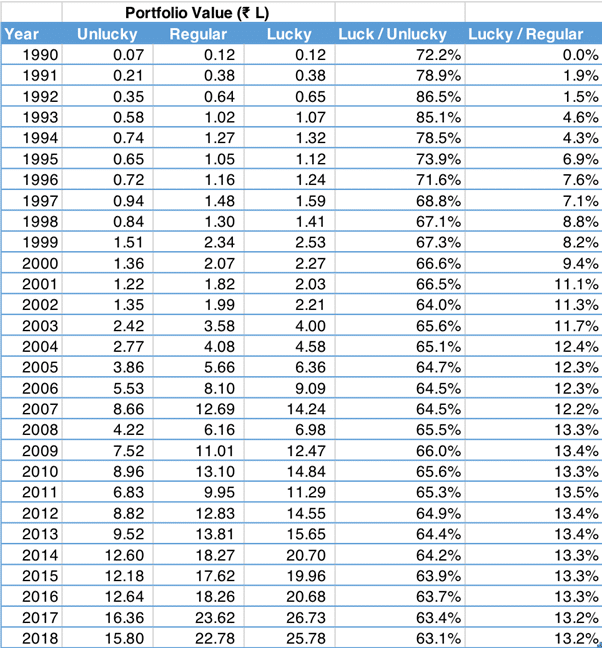 Table shows year-end portfolio values and range between Lucky / Unlucky and Lucky / Regular values. Over 28 full years, all investors put in equivalent amounts but end (Mar 2018) with portfolio values differing by over 60%. Not surprising given the conditions but note even the unluckiest investor saw a compound double-digit rate of return. 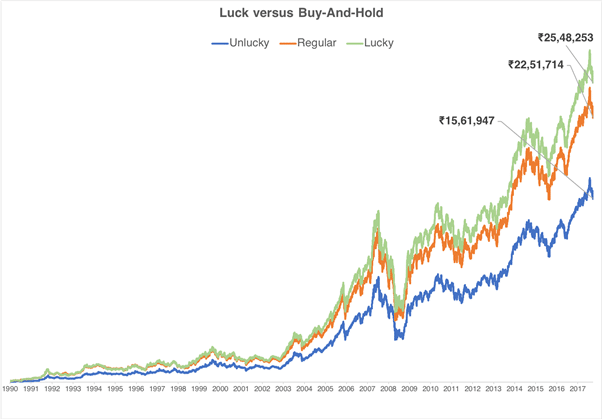 Note the narrow range between the outcomes of the luckiest investor and that of a disciplined and regular investor. If you’ve been investing for longer than the last couple of years, you already know randomness plays a big part in investing outcomes. And what is randomness at the system level translates to luck at the individual level. What’s not very intuitive is that even with really bad luck, you still make a return superior to so-called “risk-less” fixed deposits provided you’re disciplined about investing regularly. Not only that, the regular investor is not too worse off than one who’s particularly skilled at identifying market bottoms. In fact, attempting to find bottoms will only give you a superior return if you also attempt to find the tops. Staying fully invested through steep market falls after you buy will take your returns down to the “regular” levels.